Grevillea ‘Winpara Gem’ is a hybrid whose parents are said to be G. thelemanniana and either G. argyrophylla or G. olivacea and grows into a dense shrub reaching a height of two metres. Grey-green leaves are about six centimetres long, lobed with four or five segments. Flowers appear from autumn to spring. Buds are pink, open to deep red and age to orange (see thumbnail). The blooms are held in large racemes and appear on older wood. Honeyeaters are partial to the nectar-filled flowers. The blooms are an outstanding feature of this hybrid with their size and unusual colour. Grevillea ‘Winpara Gem’ would make a colourful and bird attracting screening and hedge plant. We have many specimens in our cold climate garden. Some are over ten years old. 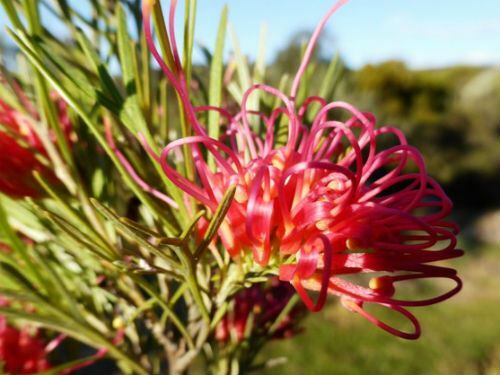 Grevillea ‘Winpara Gem’ appeared in a garden on the Winpara property, in Western Australia, and was registered in 1984. Grevillea ‘Winpara Gold’ is similar in all respects except that the flowers are pale golden in colour and is just as hardy and colourful as G. 'Winpara Gold'.